The Charted Cheese Wheel infographic poster is your cheese cheat sheet to success. The infographic can be found at popchartlab.com in poster form for purchase at $28. 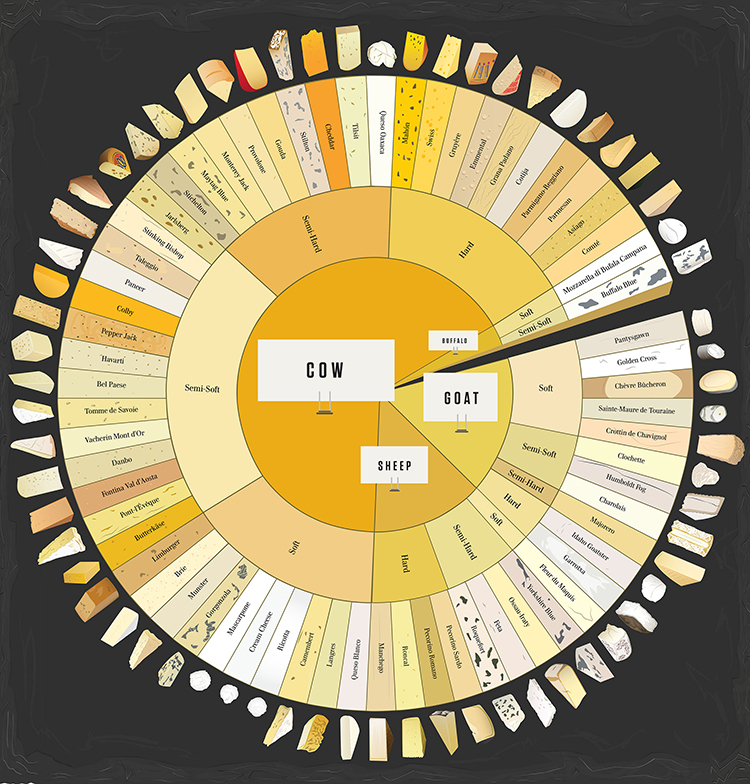 A charting of 65 delightful cheeses from around the world, assembled into one wondrous wheel. The cheeses are broken down by the animal that produced the luscious milk, and then by the texture of the resultant cheese, forming a cornucopia of cheese that range from the mild to the stinky and from the rock hard to the silky smooth. The chart includes all-time greats like Cheddar, Brie, and Mozzarella as well as foodie faves like Stinking Bishop and Humboldt Fog. Each print is signed and numbered by the artists, and comes packaged in a Pop Chart Lab Test Tube. See below for finishing options, and note that framed prints require an additional 3-4 business days of processing time. The infographic is organized well. There is a lot of cheese out there and Pop Chart Lab was able to organize 66 different varieties of cheese into easily-understood categories.